From day-1 in our original 1000 square foot studio right up to the present in our state-of-the-art 5000 square foot center, we have been dedicated to providing students of all ages with the best training in Israeli self-defense, fitness, and fighting. Our students come from Nassau and Suffolk Counties, Queens, Brooklyn, Manhattan, Staten Island, the Bronx, Westchester and beyond. Owned and operated by ‘brothers in arms’ Michael Blitz and Michael Cohen, and staffed by outstanding, multiply-certified instructors, Blitz Krav Maga has provided nationally and internationally recognized instruction to civilians, police officers, military security, private security, corrections officers, Federal air marshals, school teachers and administrators, homemakers, religious and community groups, and more, and we are proud to have been selected to be the providers of security training at Madison Square Garden and the Jacob Javits Center in NYC. We started out as a small family-run business; today, Blitz Krav Maga has grown to be the region’s leader for self-defense and specialized training. Defensive tactics must include explosive counter-attacks simultaneous with the defense. Target the body’s most vulnerable spots – eyes, throat, groin, etc. Completely neutralize the attacker(s) through the use of a high-speed, relentless sequence of counter-strikes and tactics. Maintain 360-degree awareness of surroundings while dealing with the threat or attack, in order to look for escape routes, additional attackers, or objects that could be used as weapons. Hand-strikes – while Krav Maga practitioners use a wide variety of punches, palm-strikes, and so on, the emphasis is on targeting these strikes to the body’s most vulnerable spots. In Krav Maga, the defender uses hands to strike the groin, throat, jaw, etc. In addition, students of Krav Maga are taught to use hands and fingers to gouge eyes, collapse the attacker’s throat, tear off ears, and more. Elbow-strikes – in Krav Maga, elbows executed in all directions play a significant role in close-quarter counter attacks. Kicks – Krav Maga emphasizes low and mid-height kicks to maximize effectiveness while minimizing the chance that defender will be off-balance as a result of a higher kick. Since Krav Maga practitioners always train for worst-case scenarios, the assumption is that the defender may be wearing bulky clothing and/or carrying a heavy load of some kind, making higher or more complex kicks less effective than simpler, equally damaging kicks. Additional strikes – in Krav Maga, defenders are taught to strike with knees, head-butts, shoulders, thumbs, and more, as necessary. Defensive tactics – Krav Maga makes use of a variety of simple blocks and redirections. The idea is always to use the most natural and reflexive movements to execute defenses and counter-strikes. Krav Maga techniques for defending against stick-attacks, for example, may also be used against certain knife attacks precisely because they are simple, effective, reflexive, and provide the defender with maximal opportunity to counter-strike explosively. Ground fighting, throws, and take-downs – Krav Maga training requires that students become highly skilled in all of these areas, not so much because they are preferred fighting techniques but because attackers may attempt to use such techniques. The skilled Krav Maga practitioner must be able to recognize and defend against these techniques. Weapon-defenses – Krav Maga training assumes that the defender may find him or herself in a ‘worst-case’ situation. In the case of a threat or attack with a weapon, the Krav Maga practitioner is trained to redirect and control the delivery-system of the threat or attack (i.e. the gun, the hand/arm of the knife-attacker, and so on), to attack the attacker explosively and decisively, and to disarm—if necessary—the attacker. Krav Maga training also entails learning how to use the attacker’s weapon against him. Defenses against multiple attackers – In keeping with the concept of ‘worst-case’ scenarios, Krav Maga students train extensively for situations in which there may be multiple attackers, such as (a) two or more unarmed attackers; (b) two or more attackers where one or both are armed with ‘cold’ weapons—i.e. knives, sticks, blunt objects; (c) gang attacks where attackers may be variously unarmed or armed. With our highly trained staff, real-world facilities, and total dedication, we have been Long Island’s top rated Krav Maga training center since 2003. 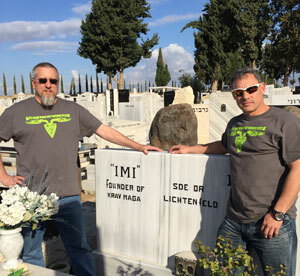 At the grave of Imi Lichtenfeld (S’de Or) – Founder of Krav Maga. Imi, as he is universally known, emigrated to Palestine from Hungary. Soon after Israel declared independence as a state in 1948, Imi changed his last name from Lichtenfeld (“Field of light”) to the Hebrew translation: S’de Or. All Krav Maga practitioners owe a debt of gratitude to Imi.